The community of Davis comes together to remember 22-year-old Natalie Corona after she was shot and killed after conducting a traffic stop. Sam Brock reports. 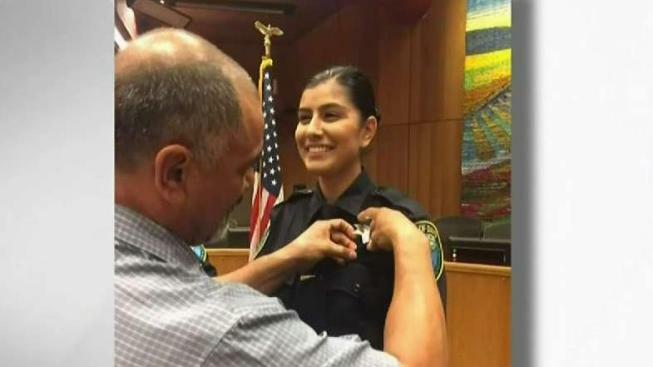 A 22-year-old Davis police officer, on the beat for just a few weeks and considered a rising star in her department, was shot and killed Thursday evening while responding to a traffic accident in the Northern California college town. Officer Natalie Corona's suspected killer was found dead from what appeared to be a self-inflicted gunshot wound at a house in the area, according to the Davis Police Department. The shooting occurred about 6:45 p.m. in the area of Fifth and C streets near downtown, police said. Corona was responding alone to a three-car crash in the area when she was shot. Corona was rushed to UC Davis Medical Center in Sacramento, where she later died, police said. Police have not determined what prompted the attack. Corona first joined the Davis Police Department in 2016 as a part-time community service officer, graduated from the Sacramento Police Department Academy over the summer then completed a six-month field training just before Christmas, The Davis Enterprise reported. "She was a rising star in the department and I've known her for a couple years," Davis Police Chief Darren Pytel said in a late-night news conference. "She started as a part-time employee, volunteer. I can tell you that I've never seen anybody work harder in a part-time capacity and be more motivated to be a police officer than Natalie. She's just absolutely a star in the department and somebody that pretty much every department looked to as a close friend, a sister." Pytel added she had "been out on her own for just a couple of weeks." Corona's father Merced Corona has worked as a sheriff's deputy in Colusa County for 26 years and a local newspaper there had written a story about him pinning his daughter's badge as she was sworn in as an officer, The Sacramento Bee reported. "I just want her to know we’re going to miss her a lot The whole family is going to miss her a lot & we are very proud of her," Corona told NBC Bay Area. Corona said his daughter never wanted anything else but to be a police officer — just like him. "I couldn’t get her to talk about anything else but law enforcement ... she wanted to follow in my footsteps. Every chance she got she’d go on a ride along with me," he said. "I’m not angry I don’t think any of us are angry. We want some answers some basic what happened but we’re not angry people. People are going to pay the ultimate price sometimes for protecting us and keeping us safe. And she signed up to do that." Police had issued a shelter in place across Davis as officers searched for the suspect and the UC campus was placed on lockdown. Later Thursday night, police were focused on a house in the same general area of the shooting where they found the suspect dead. Police haven't provided details about the suspect. As news spread of Corona's death, police departments and others began to pay tribute to her across social media. Some of the posts featured a photo that Corona had shared on her Facebook page that showed her holding a "thin blue line" American flag. The flag honors sacrifices made by those in law enforcement. Chief Pytel said the investigation would be led by the Sacramento County Sheriff's Department. Davis is located about 20 miles west of Sacramento, California. This was the first fatal shooting of an on-duty officer in the city since 1959, according to the Enterprise. Gov. Gavin Newsom has ordered Capitol flags to be flown at half-staff Friday to honor Corona. "Jennifer and I are terribly saddened to learn of the death of Officer Corona. Officer Corona was protecting her community from harm when she was tragically shot by an armed subject. Despite the valiant efforts of paramedics who rushed her to the hospital, and UC Davis Medical Center personnel, she succumbed to her injuries. We join all Californians in mourning the loss of this courageous officer and extend our deepest condolences to Officer Corona’s family, friends, and coworkers," Newsom said in a statement. Corona is survived by her father, Merced Corona, her mother, Lupe Corona, and her sister, Jackie Corona, according to the governor. Her father told NBC Bay Area that it was his daughter’s dream to follow in his footsteps. He said he couldn’t be prouder of his daughter. Corona is the second officer killed in California in recent weeks. Newman Police officer Cpl. Ronil Singh, 33, was shot and killed on Dec. 26 after a traffic stop. Gustavo Arriaga Perez was charged with the murder. Jodi Hernandez contributed to this report.